Weekend Warrior - Videos to get your Stoked. However, one should not forget their native homeland. For me, this is the Cascades. There is TOO MUCH good climbing here. As I transition from rock climbing into more snow and ice, Baker keeps staring me in the face. I feel like the worst Bellingham resident when I tell people I just haven't done it yet. The bottom line is that it needs to get done, soon. Good weather is here, and people are starting to summit Baker along with many other things in the Cascades. You should too. The Fabulous Baker Boyz from Kevin Ault on Vimeo. Even more Baker action....Looks like this group hit that ONE good weather window in May. Mount Baker May 2010 from AdrienHD on Vimeo. Leavenworth, Squamish, Joshua Tree, the Sierra, Red Rocks, Yosemite, and the Gunks are just a handful of places where climbing pioneers used fixed gear that was subpar a long time ago. 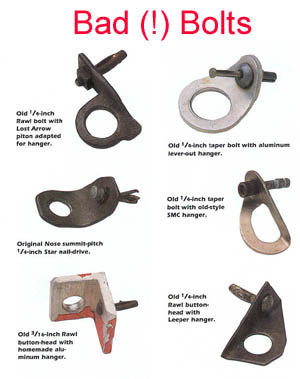 Bolts used thirty or forty years ago still exist throughout the climbing world. And every year that they remain in the rock, their quality deteriorates more. So what does a bad bolt look like? The following diagram shows a number of old bolt fixtures. It is unlikely that any of these ancient bolts or hangers would hold body weight...much less a fall. The question then becomes, what should you do if you come upon an ancient bolt? First, remember where you found it. Keep track of bad bolts and report them on you local climbing website. There are a few good Samaritans out there looking for bolts to replace. Second, decide whether or not you need it. In some cases, there is good natural gear nearby. In others, you will have to commit to using the bolt. If you do have to use it, continue climbing and try to get something solid in as soon as possible. If it doesn't look like solid gear is a possibility and the terrain above the bolt is difficult, consider bailing. If the bolt is part of an anchor system, you may be required to "beef-it-up." 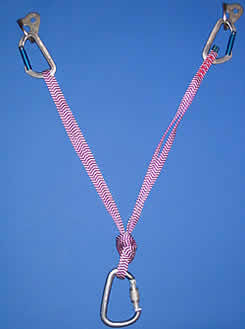 Some climbing instructors use a 12 point rating system to evaluate an anchor. Different pieces of gear are given a value of 0-12. Once you reach 12, your anchor is considered "bomb-proof." In other words, a good cam is worth 4 points, a good bolt is worth 6 points and a giant tree with a good root base is worth 12 points. Most of the time climbers have to equalize a number of different pieces in order to bring the value of their anchor up to 12. Bolts like those in the diagram above should only be given a value of 1 or 2. Many people have been taught that an anchor is composed of two bolts or three pieces. The reality is that an anchor should include whatever you need in order to make it worth 12 points. If two bad bolts are equalized, the anchor would only have a value of 3 or 4. In such a case more pieces would have to be added to supplement the bolts. Don't get lulled into a sense of complacency by shiny new-looking bolts, a small percentage of these are bad too. Some bolters use substandard equipment because it's cheaper. Others may place a bolt incorrectly. These are hard things to evaluate on the sharp end of the rope when your forearms are completely pumped out and you're about to whip. There are three ways to evaluate a route with new-looking bolts prior to climbing it. First, look through the guidebook and see how many routes the first ascentionists put up. The more routes they have to their names, the less likely it is that they made a mistake bolting. Second, the more popular the route is, the more likely it is that the bolts have been evaluated by people who have placed a lot of bolts. Indeed, on a popular route it is also more likely that the bolts have held falls. And third, question the locals. 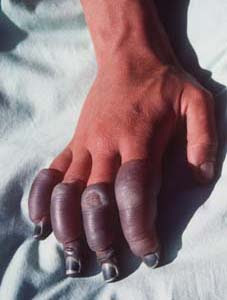 If there is something amiss on a route, local climbers are usually aware of it. People laugh when I tell them that I trust traditional gear more than I trust bolts. The reality is that with trad climbing I can always assess my own placements and I can always adjust them until they're perfect. There is little that I can do with a bolt that was placed by a stranger. And even less that I can do if it's thirty years old. That's not to say that I don't trust new-looking bolts. I do...but I do so with reservations. Since we covered the super-munter yesterday, I thought that it might be good to revive this old post about the munter-mule. The UIAA welcomes China’s decision to ban people under 18 years of age from climbing Mount Everest. According to press reports and climbing and trekking agencies in Nepal, the decision was taken on June 10 by the Lhasa-based Chinese Tibet Mountaineering Association (CTMA) - a branch of the Chinese Mountaineering Association, which is a UIAA Member. The move was welcomed by the Nepal Mountaineering Association (NMA). “While concerned about the restrictions on the freedom for exploration and human endeavour, the UIAA Access Commission applauds the actions of the CTMA and the NMA to protect minors by placing a lower age restriction on summiting Everest,” said commission president Clare Bond. UIAA President, Mike Mortimer, also greeted the Chinese decision, saying young mountaineers lacked not only climbing “experience”, but also maturity. However, Mortimer is critical of the maximum age of 60 set by the CTMA. For her part, Bond emphasises that the UIAA continues to “encourage the active participation of all ages and members of society in climbing and mountaineering and the freedom to participate in the sport and enjoy the mountains”. The UIAA co-ordinates around 10 youth events in the world’s mountains each year, and in 2011 plans to run a youth project in Nepal, which, according to Arran, will “focus on an exchange of mountain skills between countries and supporting environmental and sport development challenges relevant to youth in Nepal”. The CTMA is the official channel through which climbers must apply for permission to attempt peaks in Tibet. According to Lindsay Griffin of the British Mountaineering Council (BMC) writing on the BMC website, it is not yet unconfirmed if these age restrictions will also apply to other high peaks on the Himalayan divide. Griffin says “the decision has been made in the aftermath of (May’s) Everest ascent by 13-year-old Jordan Romero”. “Nine years ago Nepali schoolboy Temba Tshiri became the youngest Everest summiteer at the age of 16 (and 17 days) but lost several toes and fingers to frostbite. This put pressure on the Nepalese government to ban young climbers, and in 2003 it set a minimum age of 16. However, there is currently no upper limit,” Griffin added. Last week, I made my first real climbing tick list. For those of you who follow this blog, you may have realized that my climbing background was fairly limited to bouldering and sport climbing (until I started working here, that is). The list is quite long and it's just for the Cascades. Mark and Janelle Smiley have a pretty big goal: To be the first people to climb all of the routes on that list. No married couple has attempted such an endeavor to climb over 164,000 vertical feet of technical terrain on a road trip that will cover over 25,000 miles. Smileys Project Committed: Castleton Tower (1 of 50) from Mark Smiley on Vimeo. There is something to be said about local crags. Oftentimes, our backyards are composed of friable rock, sketchy bolts, and generally, they are sorry excuses for something to climb on. However, they still hold a special place in our hearts - our our "go-to" security blanket for after-work compulsions. We all have one, right? And if we don't, well, there is always plastic, right? Right! I can't make fun of the people in these videos. Maybe they live in the flattest, most desolate part of America, and this is all they have. So, props to them for being inventive. And stylish, too (those tights are kind of amazing). Plus, you can bring your kids. AAI just received the following email from Denali National Park. A 27-year-old Belgian mountaineer was killed in a fall while climbing the Cassin Ridge of Mt. McKinley in the early afternoon of Monday, June 7. Joris Van Reeth of Borgerhout, Belgium was leading a highly technical section of the route known as the Japanese Couloir when his anchor appeared to fail and he fell 100 feet in rocky terrain. Van Reeth fell to the approximate elevation of his partner Sam Van Brempt, age 24, who was positioned below him. Van Brempt was not injured, and after confirming that his friend had died in the fall, he used his satellite phone to call Denali National Park rescue personnel. A climbing ranger was flown in the park helicopter to Van Brempt’s location at the 13,000-foot level to assess the terrain for a possible shorthaul rescue, although fog and clouds moved in before a rescue could be performed. While on the reconnaissance flight, the ranger had observed a second, unrelated team climbing on the route several hundred feet below the Belgian party. According to Van Brempt who called back via satellite phone later that night, two Japanese climbers reached him in the early evening and assisted Van Brempt in lowering Van Reeth’s body down to a safer location just above the Northeast Fork of the Kahiltna Glacier at 11,500 feet. When weather permits, Denali mountaineering rangers will evacuate both Van Brempt and the remains of Van Reeth. Climbers: Danny Griffith (Bellingham, WA), Alfred Kwok (Claremont, CA), Diccon Westworth (Sacramento, CA), Jim Bonadonna (Poughkeepsie, NY), Raymond Gregory (Marquette, MI), Nancy Burke (Dallas, TX), and Margen Burke-Karr (Missouri City, TX). This is Danny calling from our base camp in the Condoriri Valley. Today after breakfast we made a fairly leisurely hike up to 17,000 on Pico [this was garbled but probably] Austria. It was great weather once again and we had excellent views of the Altiplano, Lake Titicaca, Pequeño Alpamayo, and the other peaks that we are going to be climbing. The route up is a rock and scree trail with no technical aspect to it. We scouted the cabeza (face) of Condoriri for later in the week and reconfirmed that it’s a pretty dry this year with more crevasses open than normal. It an inconvenience, not a danger, and it all looks passable. We got up to the base of the couloir, and it looks fine. Jim Bonadonna’s birthday is the 11th but we celebrated tonight because of the relatively short life-span of the cake that we got for him. Waiting until today was fine, but waiting until his true birth day would not have worked well for the cake. It was a total surprise for him. We had candles and all. He made a wish but wouldn’t tell us because that’s bad luck. Hopefully he’ll get his wish. Tomorrow we’ll get up at 8 and do some skills on the glacier and then go ice climbing. Everyone is doing very well! We’ll give you more news soon. By for now. Have you read Steph Davis's book, High Infatuation? The memory of reading this book is pretty vivid as far as book-remembering goes. This is probably because I read it two years ago on a plane ride from Chicago to Munich, and finished it in 6 hours without putting it down. I didn't even use the bathroom or eat. I don't think I've read any book in my adult life in one sitting like that. Yes, it was that good. It's way too cliche to say a book is inspiring, but I'm going to do it anyway: this book was inspiring. Steph Davis's writing is open, beautiful, and candid. It's a wonderful conglomeration of climbing, travel, life, love, loss, gain, fear, and dogs. I encourage you to 1) enjoy these videos (that never get old in my opinion) and 2) check out her blog. Salathe Wall from steph davis on Vimeo. In November of 2009, 19 year-old Dave Lama of Austria went to Patagonia's Cerro Torre to free climb it's famous and infamous Compressor Route (VI, 5.10, A2). Lama went with a large team from Europe that included a film crew and a group of guides. And the entire expedition was bankrolled by the climber's primary sponsor, Red Bull. Due to weather and conditions, the team was unable to complete the ascent. But they were able to install sixty new bolts on the established route and to leave behind nearly 2,300 feet of fixed line. Needless to say, this was not a popular thing to do. The Compressor Route is already an extremely controversial line. Indeed, it is arguably the most controversial bolted route in the world. In 1970, Cesare Maestri climbed the route to prove that he could get to the top of the mountain. An earlier ascent made on a different line was seriously disputed in the climbing community. Maestri proved that he could get to the top of the mountain, but he did it with a "by-any-means-necessary" attitude. He and his team hauled an air compressor up the spire's southeast ridge and it was with this that they installed over 450 bolts. The air compressor remains frozen to the side of the mountain to this day. 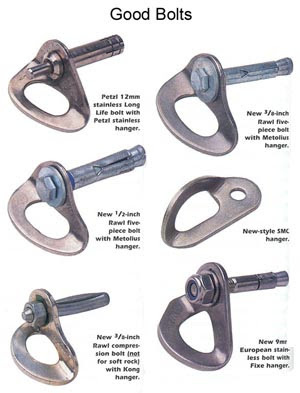 It was Maestri's 1970 ascent that lead to serious debate in the climbing community about the use of bolts. In response to the ascent, high altitude climber Reinhold Messner wrote a famous essay entitled The Murder of the Impossible. In the essay, Messner laments the fact that modern climbers "carry their courage in a rucksack" and are all too willing to employ the easiest and least challenging solution to alpine problems. The debate about Maestri's bolts on Cerro Torre never really cooled off. Though the route is heavily climbed, arguments for and against the route still rage in the climbing community. It was these arguments that lead to a series of attempts to climb the route bolt-free. In 2007, Josh Wharton and Zack Smith got the closest to a near boltless ascent of the line. They avoided clipping bolts until the last four pitches where the weather forced them to either commit to the bolts or to descend. They chose to commit to the bolts, but felt that it was still reasonable to do the route without them. The 2007 ascent turned cold opinions on the route into hot rhetoric. Not surprisingly, the debate may have become so heated in Patagonia at that time that there are rumors of fist fights over it. It is also not surprising that Dave Lama's attempted ascent of the line in November hit the climbing community with such a sour taste. The question that must be asked is how could anyone who knows the history of the route condone the placement of new bolts? How could they leave thousands of feet of fixed line? How could they hold their head up after such a high profile debacle. I can imagine Lama arriving in Patagonia with a film crew, a few European guides (they are reportedly the ones who did the bolting for the film crew, the bolts weren't for Lama's climbing), and some bad weather. The Austrian guides want safe rigging for the film crew in the sketchy weather, bolts are safe, bad decisions are made in the interest of time. Lama may not even have really seen the repercussions of this; he's focused on climbing, not filming or rigging, and he's 19 so if an older guide is making decisions about safety and rigging he might just defer, or perhaps just not even get the issue (his statement shows he clearly doesn't get the issue actually). Still, as climber, you're responsible for what goes on on your trips. Lama is responsible for those bolts, and like it or not, so by extension are Red Bull and Lama's other sponsors. Much of the climbing community is reacting specifically to Red Bull as a sponsor of the expedition. Supposedly there is a Red Bull boycott by climbers in Boulder and people have began to call the energy drink, "Red Bolt" or "Red Bullsh*t." This seems a little bit extreme, as Red Bull really had nothing to do with what actually happened on the expedition. LOL. I'm sure Red Bull is shaking in their boots. Red Bull doesn't make money off people who follow this sort of thing. They make money off the "Extreme Dudes" who buy cases of the stuff to help overcome their morning hangovers, afternoon sleepiness and to add to their Vodka at night. It seems incredibly unlikely that Red Bull is worried about climbers boycotting their product. While some outdoors people drink Red Bull, such individuals are probably not even a blip on the screen of their corporate radar. Indeed, it is likely that most people who drink the energy drink have never even heard of Cerro Torre or Dave Lama or bolting ethics or even of the word "alpinism." No, instead the pressure should be on this young climber. He doesn't appear to understand that he did anything wrong and there is evidence that this might not be the first time such a thing has happened. It appears that he might have a hard time understanding climbing ethics. As he interacts with older and more experienced climbers -- particularly alpinists with strong anti-bolting views from North America -- the gravity of the situation will likely become more clear. ANCHORAGE – The National Park Service in Alaska has recently awarded more than $13 million in construction and other contracts from funding received through the American Recovery and Reinvestment Act, passed by Congress last year. The three largest projects will result in major improvements in the front country of Denali National Park and Preserve. The park’s wastewater treatment lagoon will be replaced and its collection system will be rehabilitated. The $5.35 million project – awarded to Northstar Paving and Construction of Anchorage -- includes a new 100,000-gallon per day wastewater treatment facility to replace the lagoon. A second project in the Denali front country will be a new emergency services and law enforcement facility will be built, replacing an aging dispatch office. The facility will provide heated and secure parking for multiple emergency vehicles and work space for the ranger staff, as well as house the park and regional communications center. An additional Denali project is the rehabilitation and replacement of a major utility system in the front country employee housing area. The work includes removing and replacing three large underground storage tanks and replacing with above-ground tanks; replacing electrical transformers with new, high-efficiency models; and the replacement of waterlines and waste water collection lines. The $7.49 million projects were awarded this month to Dawson Construction of Bellingham WA. In Glacier Bay National Park, McGraw Custom Construction of Sitka was awarded a $539,600 contract to demolish and replace storage buildings used as boat, vehicle and equipment storage in winter months. Seven NPS units in Alaska will benefit from energy audits funded by the Recovery Act funds. The audits will evaluate energy and water consumption, identify energy efficiency and renewable energy projects at the parks, and demonstrate to the visiting public the technologies and opportunities for sustainable management. The contract for $101,214 was awarded to Gable Associates of California. The American Recovery and Reinvestment Act appropriated $3 billion to the Department of the Interior. Of that amount, $750 million in funding goes to the National Park Service. Apply: Return the application by June 25. Applications are available at www.fs.fed.us/r6/mbs/volunteering/mtn_steward and can be emailed to brichey@fs.fed.us. Mail to Mt. Baker Ranger District, Mountain Stewards, 810 State Route 20, Sedro-Woolley, WA 98284, or fax to 360-856-1934. Call 360-854-2615 for more information. Two backpackers, a man and woman, encountered a grizzly bear Friday evening while hiking in the dense brush along the edge of Tattler Creek, which is at the west end of the Igloo Canyon, approximately 35 miles from park headquarters. The man, who was in the lead, drew a .45 caliber semi-automatic pistol when they heard a noise coming from the brush. When the bear emerged from the thicket and ran toward the other hiker, he fired approximately nine rounds in its general direction. The bear stopped, turned, and walked back into the brush, where it quickly disappeared from view. The backpackers ran and hiked approximately 1-1/2 miles back to the road, where they encountered a National Park Service employee, who called in the incident to the park’s communication center and transported them to the Toklat Road Camp. A ranger there did a short preliminary interview with them at approximately 10:00 p.m. Because of the concern that a wounded bear was in the area, four backcountry units were immediately closed, and bus drivers were instructed to not drop off day hikers in the Igloo Canyon on Saturday. Early Saturday morning rangers and wildlife technicians flew to Toklat via helicopter to conduct a secondary interview with the two backpackers. Afterwards they flew over Tattler Creek and all of side tributaries, very low at times, to determine if there was an active, wounded bear. No bears were seen during the overflight, and late in the afternoon three rangers hiked into the site. The bear was found dead in a willow thicket approximately 100 feet from the pistol casings at approximately 6:00 p.m. The bear’s body was transported via helicopter to a landing site on the park road and brought back to headquarters on Sunday, where park wildlife biologists are assisting with the investigation of the bear carcass. The backcountry units have been reopened. The case is still under investigation, and the names of the backpackers are not being released at this time. Park wildlife biologists and rangers are trying to determine if there was a justification for shooting the animal. It is legal to carry a firearm in the former Mt. McKinley National Park portion of the park, but it is not legal to discharge it. This is the first known instance of a grizzly bear being shot by a visitor in the wilderness portion of the park. The estimated grizzly bear population in the park north of the Alaska Range north is 300-350 animals.